In 2017, UNV continued to offer innovative volunteer solutions to its United Nations partners and to UN Member States in common pursuit of the 2030 Agenda for Sustainable Development and all 17 of the Sustainable Development Goals (SDGs). UNV contributed to the engagement of citizens through volunteerism, while strengthening national ownership and capacities along with South-South cooperation. 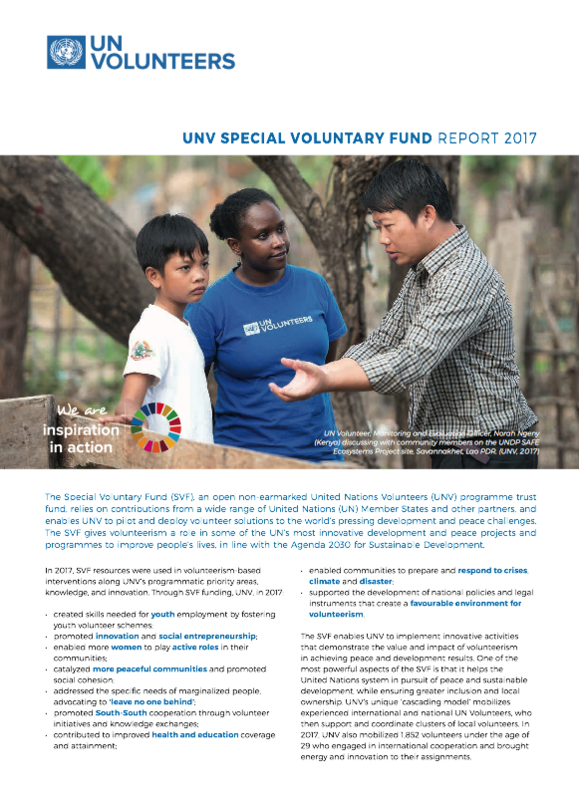 The UNV Annual Report 2017, Transforming UNV for the Global Goals, puts together our latest results and achievements, and demonstrates how UN Volunteers continue to make an impact in all five pillars of sustainable development: planet, people, prosperity, peace and partnerships. In 2017, 6,501 UN Volunteers from over 100 different professions served with 35 United Nations partners on the ground worldwide. 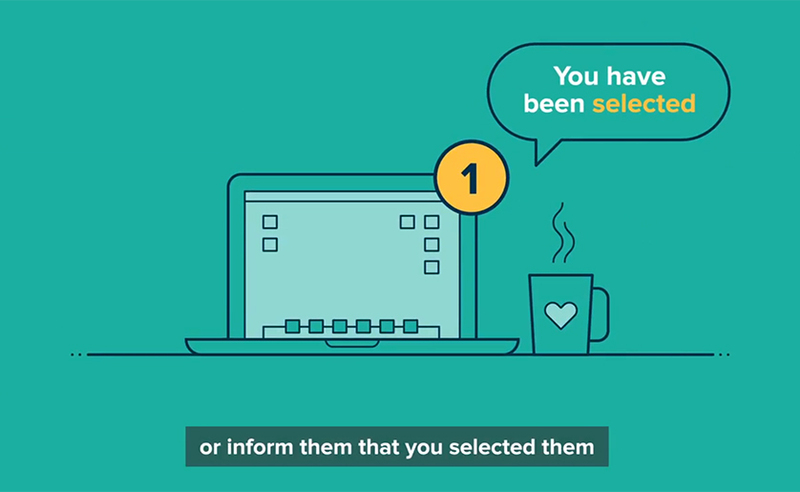 The number of UN Online Volunteers increased to 17,893, with 23,000 assignments providing flexible solutions to 38 United Nations partners and 2,200 non-governmental organizations. Of all UN Volunteers, 83 per cent came from the Global South – clear evidence that UNV facilitated South-South cooperation through the transfer of expertise and knowledge across development and peace contexts. The proportion of assignments fulfilled by national UN Volunteers grew from 28 per cent in 2014 to 40 per cent in 2017, adding weight to the global growth of volunteer movements and the increasing role of local volunteers in many communities around the world. Throughout 2017, and benefiting from the results of an evaluation of its first Strategic Framework, UNV consulted extensively with United Nations partners and Member States in its reform efforts. Our new Strategic Framework 2018-2021 will enable UNV to further its positioning as a competitive service provider. 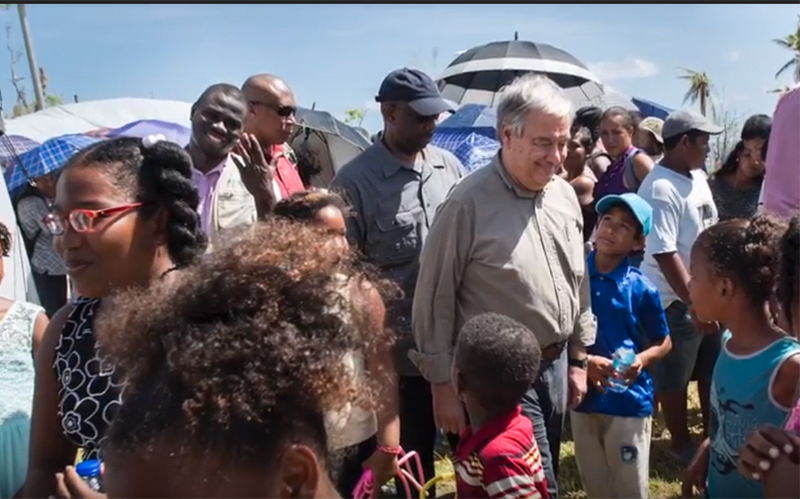 With the transformation process started in 2017, UNV will, over the coming years, be even better positioned to support the achievement of the 2030 Agenda and to uphold human rights in fast-changing peace, development and humanitarian contexts – while always striving to leave no one behind. Online volunteering allows organizations and volunteers to team up to address sustainable development challenges – anywhere in the world, from any device. Online volunteering is fast, easy – and most of all, effective. When skilled, passionate individuals join forces online with organizations working toward sustainable development goals, everyone wins. During 2017, UN Volunteers, UN Youth Volunteers and UN Online Volunteers delivered results advancing sustainable development. UN Volunteers serve in all development and peace situations, including in difficult contexts and remote locations. They work in local communities to leverage synergies between local knowledge and expert solutions. UN Volunteers constitute a flexible resource in ensuring scale, impact and sustainability in peace and development interventions, including in crisis and post-crisis situations. 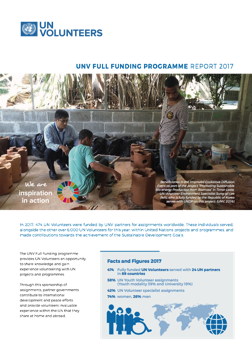 This Annual Report 2017, Transforming UNV for the Global Goals, showcases results delivered by UNV and its UN Volunteers for the five pillars of sustainable development: planet, prosperity, people, peace and partnership. Click on the icons to read more about our delivery in partnership with the United Nations, UN Members States and civil society, and through our valued UN Volunteers. In 2017, UN Volunteers engaged in climate action and volunteering for the planet at the global, regional and national levels, demonstrating that volunteerism remained a powerful force in sustainable land use, biodiversity, ocean health and climate initiatives for generations to come. Click on the links below to read about UN Volunteers for the planet. Volunteerism enabled personal growth and innovation within supportive national and regional structures in 2017. Through volunteerism, UNV advocates for an opportunity to contribute to the SDGs – regardless of a person’s economic status, gender, education level, ethnicity or disability. UNV leaves no one behind. Click on the links below to read about UN Volunteers for prosperity. Through volunteerism, every global citizen has the opportunity to contribute to the SDGs. By volunteering, people take on responsibility for their own community, solidifying local ownership of development goals. Within the Global Goals for People, UNV actively supported the efforts of United Nations partners and Member States in the global fight against poverty, gender inequality, humanitarian suffering and hunger in 2017. Click on the links below to read about UN Volunteers for people. In 2017, 2,169 UN Volunteers supported the UN Departments of Field Support, Peacekeeping Operations and Political Affairs: in UN peacekeeping missions in the Central African Republic, Côte d’Ivoire, Democratic Republic of the Congo, Haiti, Kosovo (as per UN Security Council resolution 1244), Liberia, Mali, South Sudan, Sudan and Western Sahara, and political missions in Afghanistan, Colombia, Guinea-Bissau, Libya and Somalia. Click on the links below to read about UN Volunteers for peace. Deploying global citizens as UN Volunteers and effectively integrating volunteerism into United Nations’ programming for 2017 relied on strong relationships between UNV and its partners. 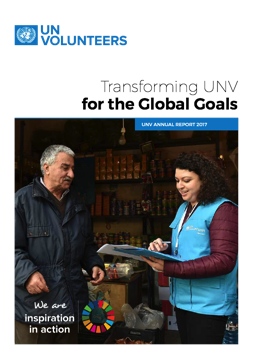 In 2017, UNV worked closely with 38 United Nations partners, Member States, academic institutions and non-profit organizations along with the private sector and civil society. Click on the links below to read about UN Volunteers for partnerships. UNV partners with you to mobilize skilled UN Volunteers who make valuable contributions, advance your delivery and provide strong results. UNV has developed service lines to provide partners with a set of standardized volunteer assignments in areas such as monitoring and evaluation, electoral support, health emergencies, and in support of international and national events, the Resident Coordinator system or UN partners at headquarters duty stations. UNV thanks its UN Member State partners for their generous contributions in support of volunteerism for sustainable development and peace. * Amounts indicated are in thousands of US dollars. UNV is as strong as its partnerships. UN Volunteers deliver on sustainable development for our United Nations partners. During 2017, 6,501 UN Volunteers and UN Youth Volunteers, national and international, served with 38 United Nations partners in support of peace, security, human rights and humanitarian delivery. UN Volunteers advance sustainable development every day by fostering participation, building social cohesion and promoting dialogue within communities. They serve with UN partners, working tirelessly in support of their development, peace and humanitarian efforts. 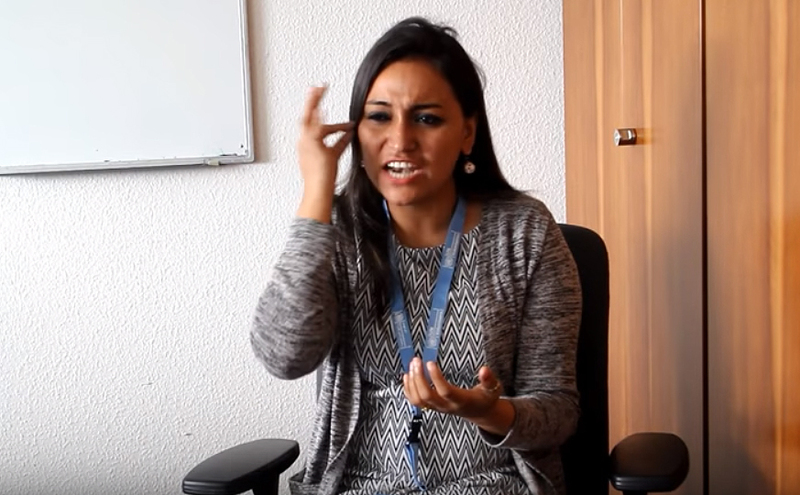 In these videos, we feature inspiring UN Volunteers in action. 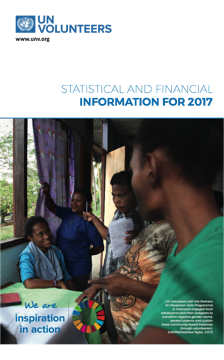 Every three years, UNV produces a flagship report to strengthen understanding volunteerism and demonstrate its universality, scope and reach. SWVR 2018 examines the distinctive role of volunteering in strengthening community resilience. 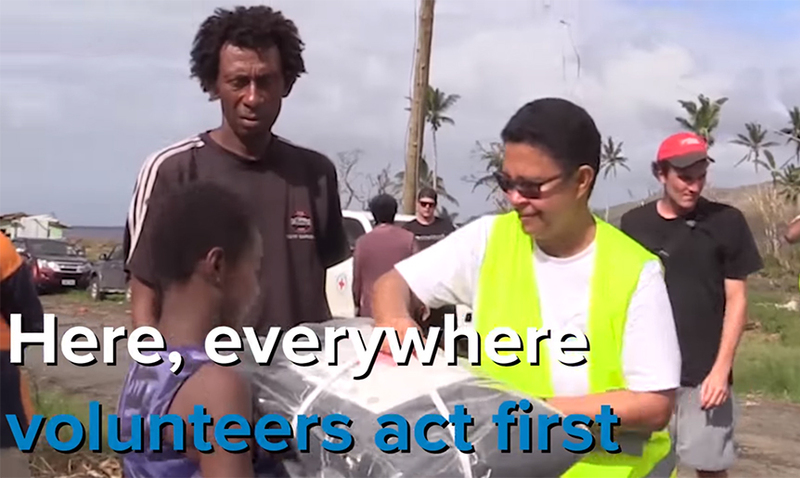 Learn more about how nine UN Volunteers with UN Climate Change (UNFCCC) mobilized and managed more than 650 local volunteers. 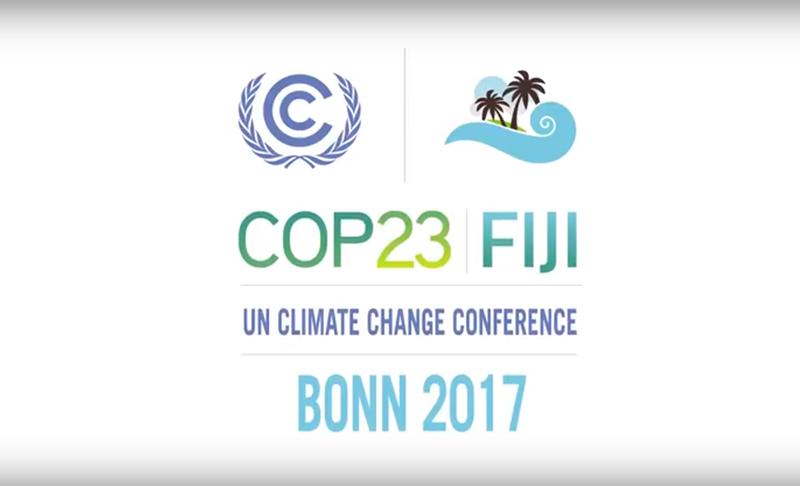 Their joint efforts contributed to the success of COP 23 in Bonn, Germany, from 6-17 November 2017. Visit unv.org/become-volunteer for information on how to register as a UN Volunteer in your country or abroad, or as a UN Online Volunteer.